How's the foetus during week 39? Your baby is about the 50 - 51cm in length and weighs about 3.2kg. Your baby's settling into the pelvis and is protected by the pelvic bones. Her lungs are already functioning. Your baby fills most of the uterus and can't move around much anymore, but when she does, you'll feel it. Most of the downy covering of lanugo has gone from the skin. Your baby may have a full head of hair. Walking may become more difficult because the baby has dropped into the pelvis. You will need to the loo more often because of pressure on your bladder. By now, you would probably have put on between 11.5 and 13.5kg. Get strong, stay centered and prepare your body for labour with the ancient art of yoga. Start practicing your breathing now if you haven't already. Your little one's umbilical cord is now 50 cm long and is 1.3 cm thick. All babies are different sizes. If your baby has not grown adequately and there is not enough amniotic fluid your doctor might not want you to go any further in the pregnancy. Either way, he's due any day now! You may feel frustrated, achey and a bit discouraged as you wait, sometimes impatiently, for your baby to arrive. There are ways to try and bring on labour, safely, of course. Though they don't always work - your baby will release a hormone when he's ready to arrive, which will naturally start your labour. If you've planned a Caesearean you may already have given birth! If you haven't discussed it yet, think about bringing up the topic of banking your baby's cord blood. Stem cells are the basic building blocks of all human tissue. These cells have the capacity to grow into different types of tissue that make up various organs. Research mostly centres on their curative quality because stem cells can be injected into the blood or an organ where they can grow to replace damaged tissue. If you can afford it, you should strongly consider storage, especially if you have a family history of illnesses treatable with stem cells. During the first stage, your uterus will contract at regular intervals, thinning and stretching out your cervix. At the second stage, you'll be pushing your baby through the vaginal canal and out into the world. 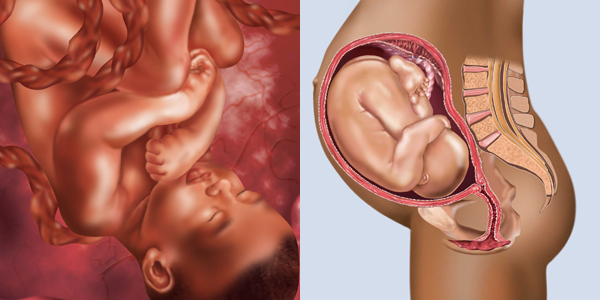 In the third and final stage, you'll deliver the placenta which has been nurturing your baby throughout your pregnancy. Just as sports psychologists encourage world-class athletes to mentally picture themselves at each phase of an upcoming competition, it's a good idea for you to go over the three stages of labour in your mind. Imagine yourself in each situation. If you've been practicing breathing with your partner, for example, envision the two of you working through your contractions together. Although labour seldom turns out as planned, a bit of "visioning" can help you handle some of the unexpected twists and turns. Sign up for our baby calendar with updates on your baby's development and care from month 1 to 12!